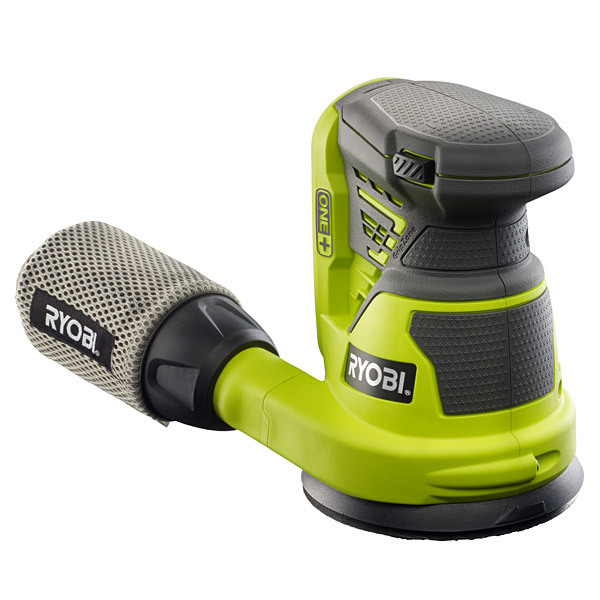 The Ryobi R18ROS-0 is a body only 18v Random Orbit Sander that has just arrived to join the One+ family of tools. This means it will quite happily run off your existing 18v NiCad or Lithium batteries. This sander is compact and ideal for light to medium weight applications, such as fine finishing and paint removal. Great for restoring old furniture. The benefits of using a Random Orbital Sander is that you can be assured to have a swirl free finish at the end – just like the professionals! The Ryobi ONE+ cordless Random Orbital Sander delivers amazing performance, with a 2.5mm orbit diameter, even more than some corded sanders! As for runtime, you can get up to 40 minutes continuous use out of the high capacity 5.0Ah Lithium+ battery [RB18L50]. Also comes with a built-in dust extraction system so you can look forward to a clean working environment and no dust in your eyes! Uses a hook and loop accessory fastening system and comes with three sanding sheets to get your project started straight out of the box.